When you’re craving a bite of culture, indulging in a tasty meal is literally the best cure. For cities, states and whole countries, food says a lot about the local people and their way of life. Whether they grow, raise, catch or import, every place has a story within its cuisine. In the Pacific Northwest, our pace may be a little slower than other parts of the country, demonstrated by our booming craft culture. But on the flip side, there are always busy professionals buzzing about, lending itself to trends like the food truck revolution. To the west, beautiful water offers up delicious seafood. To the east, prime land yields lush crops. 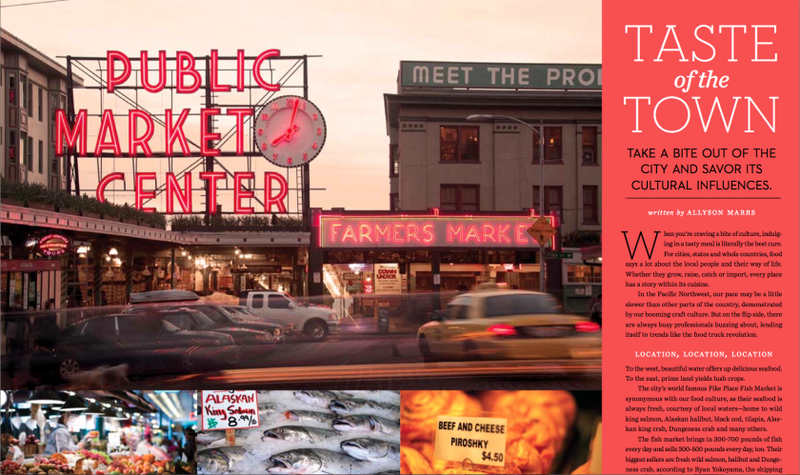 The city’s world famous Pike Place Fish Market is synonymous with our food culture, as the seafood is always fresh, courtesy of local waters—home to wild king salmon, Alaskan halibut, black cod, tilapia, Alaskan king crap, Dungeness crab and many others. According to the Washington State Department of Agriculture (WSDA), the state’s proximity to pertinent Asian markets aids in the state’s trade practices, seemingly bringing the rest of the world within arm’s reach. With rich soils and diverse climates, the state is also a mecca for produce. The WSDA says that Washington farmers produce about 300 crops each year, making it one of the most productive regions in the world. When land and sea converge, gastronomic opportunities of all kinds arise; residents have the ability to raise cattle, grow fruit and vegetables and catch seafood. It’s no wonder we take food so seriously here, and expect so much from it. The rain may be an inconvenience at times, but it has some delicious results. It helps grow the fruit and vegetables that many are lucky enough to pluck right from their backyard (or local farmers markets). Even in the heart of the city, produce can flourish. The result is apparent in the area’s menus, as people have come to expect fresh ingredients in everything they consume. In 2011, Pike Place Market had more than $12 million in revenue, according to a report by the Pike Place Market Preservation and Development Authority. The state is also ranked as first nationally in eleven crops, including apples, cherries and red raspberries. It ranks second or third in eleven other crops, according to Washington Farmworker Services. In 2011, there were nearly 40,000 farms, led by the apple orchards, which account for 60 percent of U.S. production. Agriculture is a $46 billion industry in Washington, with more than $15 billion in food and agriculture exported through our ports in 2011, according to WSDA. Almost anything foodies could ever want they can have locally. This contributes largely to the restaurant culture, where chains are few and specialty eateries are on every corner, using fresh ingredients that consumers have come to expect. Perhaps it’s this access that has shot so many Seattle chefs into rockstar status. We may not have bred him, but we can still call him our own. Tom Douglas is arguably Seattle’s most-famous chef with 11 restaurants and locations. He won his first James Beard Award—known as “the Oscars of food”—for Best Northwest Chef in 1994. In 2012, he collected another for Best Restaurateur. He guest starred on Bravo’s “Top Chef: Seattle” numerous times earlier this year, and his cookbook, “Tom Douglas’ Seattle Kitchen” took the title of Best American Cookbook by the James Beard Foundation. These are merely a few of his accolades. Douglas’ restaurants even have their own farm. Prosser Farm, two and a half hours east of Seattle, was established in 2006 in an effort to “narrow the gap” between his source and his plates. During the growing season, the farm ships 2,400 pounds of produce to Tom’s restaurants each week. But he isn’t the city’s only culinary celebrity. Ethan Stowell became a chef to watch in 2005, and in 2008 he became one of “Food & Wine” magazine’s Best New Chefs in America. That same year, he was nominated for the James Beard Foundation’s Best Chef Northwest. He received that same nomination in 2009 and 2010. He’s famous for his pasta dishes and his Northwest seafood plates at his six restaurants, which each pay homage to local ingredients. Lucky for the hungry, both of these men respect what the area has to offer and are continually working to showcase it.